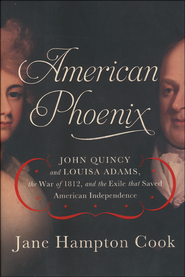 From the back cover: John Quincy and Louisa Adams’s unexpected journey that changed everything. “American Phoenix” is the sweeping, riveting tale of a grand historic adventure across forbidding oceans and frozen tundra–from the bustling ports and towering birches of Boston to the remote reaches of pre-Soviet Russia, from an exile in arctic St. Petersburg to resurrection and reunion among the gardens of Paris. Upon these varied landscapes this Adams and his Eve must find a way to transform their banishment into America’s salvation. Author, historian, and national media commentator Jane Hampton Cook breathes life into once-obscure history, weaving a meticulously researched biographical tapestry that reads like a gripping novel. With the arc and intrigue of Shakespearean drama in a Jane Austen era, “American Phoenix” is a timely yet timeless addition to the recent renaissance of works on the founding Adams family, from patriarchs John and Abigail to the second-generation of John Quincy and Louisa and beyond. Cook has crafted not only a riveting narrative but also an easy-to-understand history filled with fly-on-the-wall vignettes from 1812 and its hardscrabble, freedom-hungry people. While unveiling vivid portrayals of each character–a colorful assortment of heroes and villains, patriots and pirates, rogues and rabble-rousers–she paints equally fresh, intimate portraits of both John Quincy and Louisa Adams. Cook artfully reveals John Quincy’s devastation after losing the job of his dreams, battle for America’s need to thrive economically, and sojourn to secure his homeland’s survival as a sovereign nation. She reserves her most detailed brushstrokes for the inner struggles of Louisa, using this quietly inspirational woman’s own words to amplify her fears, faith, and fortitude along a deeply personal, often heart-rending journey. Cook’s close-up perspective shows how this American couple’s Russian destination changed US destiny. I like history so when you give me a great book with historical characters and incidents I relish my time in its pages. Jane Hampton Cook has given us a wonderful historical account of what was happening in America and the world through the story of John Quincy Adams and his wife, Louisa. John Quincy Adams was the sixth President of the United States taking office in 1824 however “American Phoenix” takes place in the period of 1815. By looking at the lives of John Quincy Adams and his wife, Louisa, Ms. Cook was able to also look at the state of the United States and its relationship with the rest of the world. America was just beginning to transform from a nation-in-name-only to an emerging world power. Adams was able to help in that transformation and also brought about the first U.S. diplomatic post in pre-Soviet Russia. All this while the couple was separated for long periods of time. “American Phoenix” is the remarkable, true story of this couple and their mark on this country and the world. This is the book to read.